staged from 25 - 27 April 2006 at the Phuket Country Club. 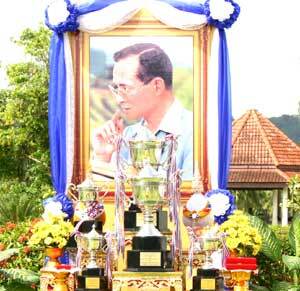 The King Bhumibol Adulyadej Cup kindly presented by His Majesty, bearing the Royal Crest. Chung Chun Hsing's Taiwanese compatriots Chang Chin Kuo and Chen Tsang Te finished second and third respectively, making it a top 3 podium finish and a clean sweep for Taiwan! The Asian Seniors Tour wish to acknowledge the kind and generous support and the considerable hard work from all parties who helped to make the inaugural 2006 ASM @ Phuket the great success it was. On behalf of the Thai Seniors PGA and their organising committee, and all participants at the 2006 ASM @ Phuket the AST would like to thank all the Sponsor's of the 2006 ASM - Phuket without whom the event would not have been possible. Sponsor's T-Box signage at the 2006 ASM - Phuket - please click to view. The Phuket Country Club and their staff most ably led by General Manager - Mr. Keat Lau and his staff deserve special mention and gratitude for all their hard work and the high level of professionalism which the golf club and its staff exhibited at all times. The Phuket Country Club and their staff are a credit to their Managing Director - Mr. Phummisak Hongsyok who is to be congratulated and thanked for both his kind support and generosity in hosting the 2006 Asian Senior Masters - Phuket - please click to view his welcome message. The support and endorsement from the Phuket Provincial Governor - Mr. Udomsak Uswarangkura is greatly appreciated - please click to view his welcome message. The kind support from Pol. Maj. Gen Surasit Sangkhaphong - Director of Government Lottery Office is also greatly appreciated - please click to view his welcome message. Special thanks and congratulations are extended to the President of the Thai Seniors PGA - Mr. Prachuab Subcharoen who worked tirelessly to make the 2006 ASM @ Phuket a reality - please click to view his welcome message. The professionalism with which the 2006 ASM @ Phuket was conducted is due to the efforts of this year's Tournament Director - Mr. Chan Muangjinda - please click to view his welcome message. Pictured above are the 2006 ASM Phuket Committee and Crew and it is with thanks their hard work and commitment that the 2006 Phuket - Asian Senior Masters was staged. Please click to view information on the various 2007 ASM @ Phuket Corporate Sponsorship packages available and the associated sponsor's benefits and entitlements. Similar corporate sponsorship opportunities exist in the ASM - Singapore the ASM - Malaysia - Series and ASM - Taiwan please click to view the various Corporate Sponsorship packages available. In 2007 the AST are confident that the second leg to the planned 2 legged ASM Thailand Series - ASM @ Bangkok will be announced in the not too distant future. Other sponsorship opportunities also exist at the planned ASM - Brunei and ASM - Indonesia legs of the Asian Seniors Tour. Finally we wish to extend our thanks to the numerous people we do know who you are from all walks of life who have helped in so many different ways, going above and beyond the call of corporate sponsorship and friendship to help make the inaugural 2006 ASM @ Phuket possible and the success it was. We remain most grateful to you all and wish to THANK YOU! individually, corporately, and collectively for your kind past and on going support, encouragement, and participation! See you at the next Asian Senior Masters golf tournament!